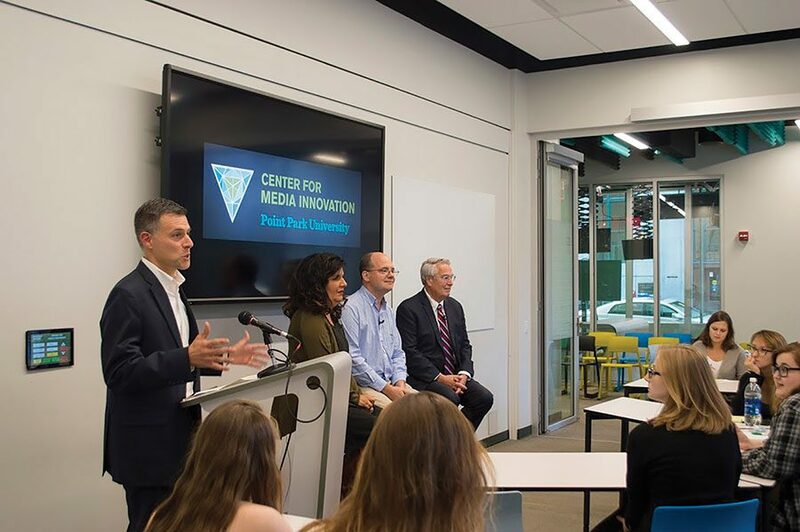 CMI Director Andrew Conte introduces local journalists Salena Zito, Chris Potter and Jon Delano for a panel about their stories covering the presidential campaign trail Tuesday, Sept. 27 in the CMI. Three Pittsburgh-based political reporters shared stories from covering candidates on the campaign trail Tuesday, Sept. 27 in the Center for Media Innovation. The panel began a scheduled series of speakers leading up to the Nov. 8 general election. The panel was structured as a question-and-answer session with Salena Zito, former columnist at the Pittsburgh Tribune-Review, Chris Potter, a political reporter with the Pittsburgh Post-Gazette and Jon Delano, Money and Politics editor at KDKA-TV. The challenge that Potter and Delano pointed out was how to localize national issues in an effort to explain how complex things such as foreign policy impact voters. Zito echoed Delano’s sentiment and said she watched the first presidential debate in a Westmoreland County bar for coverage in the New York Post on rural Pennsylvania voters. Delano said he was given only eight minutes for a recent interview with former Secretary of State Hillary Clinton and former Senator Tim Kaine, and striking a balance between asking about Primanti sandwiches and foreign policy is a tough task to accomplish. In a year where candidates and supporters shame the media, the panelists explained that both depend on each other to be successful. Panelists discussed the rise of what they referred to as “populist” candidates like Donald Trump and Bernie Sanders, as well as how reporters treat the candidates and how campaigns treat reporters. The panelists emphasized that no matter how much analysis is done by pundits and how much history is expected to dictate the future, what matters in the end is how the sentiments of voters carries to the polls. What voters truly care and know about the candidates will inform their voting decision. The next installation of the series will feature speakers from the campaigns and will take place Oct. 18 at the Center for Media Innovation.